Charlton Athletic Online: Who Are Ya? 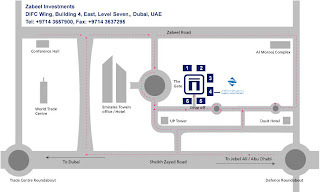 Zabeel Investments - the company that adds extra to ordinary according to thier website. But just who are the company that has made an indicative offer for the Addicks? Well, their Executive Chairman is Mohammed Al Hashimi (left), and he is the person who is fronting the offer, and who made the statement earlier today carried on the Charlton website. He a renowned Islamic finance expert, and founded Zabeel Investments in February 2006 and has been responsible for its rapid strategic expansion. Mohammed plays a hands on role in the development of the company, so it's not that we won't see him at The Valley if a formal offer is made and accepted by shareholders. As a member of the Young Arab Leaders organisation, Mohammed believes in youth empowerment and education, particularly early childhood development (JonJo Shelvey should be happy then!). Mohammed was named as one of 2008s Young Global Leaders, recognising his professional accomplishments, commitment to society and potential to contribute to shaping the world’s future (and hopefully Charlton's future too). Business-wise, Zabeel are focused on the areas of commercial real estate development and management, private equity and asset management across a wide range of economic sectors. I suppose this indicative offer means that they are also interested in getting into the English football world, and eventually the Premiership! Best is always a word that I have trouble with - who is the best footballer? Rooney, Ronaldo, Terry? Best band? Coldplay, U2, Rolling Stones? Best is opinion; Anyone can be the best - Charlton may be the best as far as I'm concerned, but deep down I know that Chelsea will beat us nearly every tme we match up...best means nothing. In addition, Zabeel say they look to build world-class products, through the creation of communities that blend with the environment and which meet today's modern standards but are imbued with their traditions and values. They obviously like the community side of what Charlton can offer and I'm sure that has had a significant impact on the potential deal. The Zabeel website asks - "Do you feel that the youth should be provided with better opportunities through which they can support our communities?" It further states "We care for the development of communities, through providing a better standard of living and creating environments that foster leadership and a desire to learn. Passion is the cornerstone of our business, and with it we can only improve and give back more." Zabeel aren't short of cash - the company is reportedly owned by Sheik Hamdan bin Mohammed bin Rashid al-Maktoum, the son of Dubai's ruler. They have been splashing the cash regularly over the last two years, buying up worthwhile companies from across the globe. They are strong in maintaining tradition and culture, helping childhood development, and aiding university scholarships. Zabeel Investments has also been instrumental in supporting shooting and falcon hunting amongst young males in the UAE, as a way of keeping traditions alive. Not much call for falcon hunting locally, though maybe Eagle Heights will get a call if they get homesick? I'm sure that the papers, websites and forums will be full of this over the next few days, but realistically, we now have to sit back and not count chickens. If a formal offer comes, it comes; if not, we haven't lost anything. There will be plenty of fans for the move and plenty against it too. Will we lose our identity? That sort of thing I'm sure. Pedro45 can only report that, as a shareholder, he welcomes the offer and if it leads to a bigger, better, Charlton, then that can only be good for the club, the fans, and the community it serves.